Dupaco Community offers an annual payout to members who save, borrow, spend, and use ancillary services at the credit union. Dupaco rewards members for actively participating in the credit union, acknowledging that what engages individual members might vary. In the past three years, the cooperative has returned nearly $9 million to its members. Dupaco Community Credit Union ($1.7B, Dubuque, IA) faced an enviable dilemma in 2015. It had a capital-to-assets ratio of 14.28% and wanted to responsibly leverage its excess capital to develop stronger relationships with members. Specifically, the 111,000-member cooperative wanted to better engage members so they’d be less likely to leave and contribute more to the bottom line. Dupaco wanted a simple, action-oriented solution that differentiated it from competitors and was sustainable in the long term. Above all, it wanted a program that rewarded members for participating in desirable behaviors it was targeting — whether that be taking out a loan, stashing away some savings, or using mobile banking. 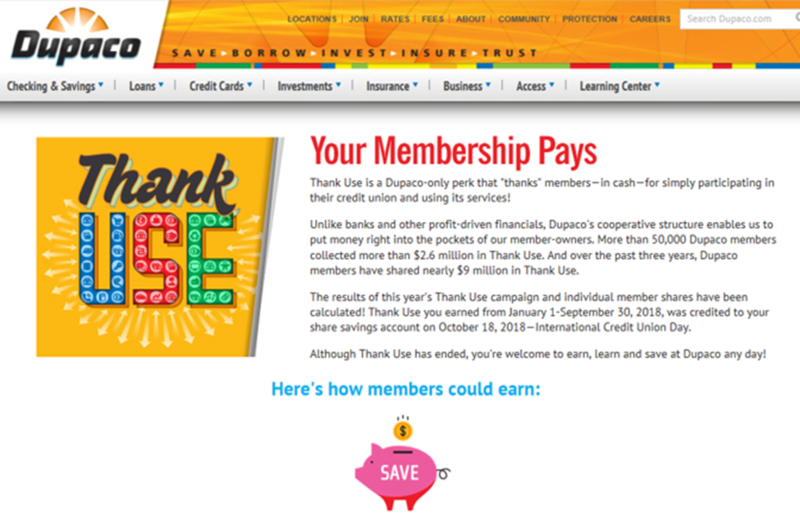 The answer — Thank Use — has returned nearly $9 million to Dupaco members in the past three years. In 2018 alone, more than 50,000 Dupaco members collected more than $2.6 million. The credit union details how members can earn cash rewards through the Thank Use program on its website. Click here to visit the website. Thank Use rewards members for their active participation with the credit union. In 2018, member earned Thank Use cash rewards when they saved, borrowed, paid (via Dupaco debit or credit cards), planned (with Dupaco Insurance Services or Dupaco Financial Services), accessed the credit union’s digital services, or improved their credit scores. The Thank Use program not only leverage Dupaco’s strength as a cooperative, it also keeps the cooperative difference front and center through a personalized dashboard, shown here, that members can view when they log in to online banking. And every October on International Credit Union Day, the credit union pays out Thank Use dividends to further highlight the cooperative difference. Dupaco offers personalized dashboards that help members see how they are earning and how they could earn more. Click here to view the website. 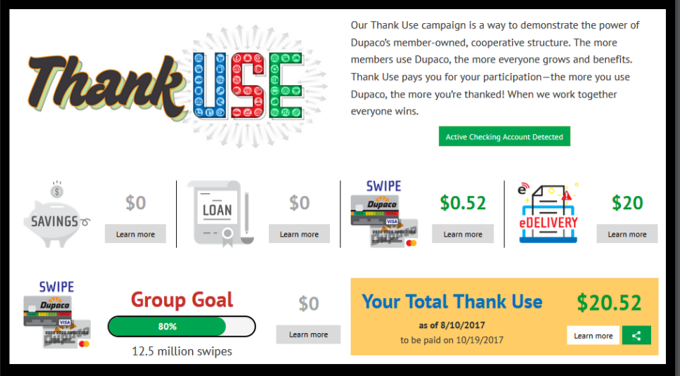 Reinforcing the cooperative difference and increasing active checking accounts have been campaign goals all three years, but Thank Use has also focused on rewarding longevity, moving Dupaco cards to top-of-wallet status, promoting CUSO services, and improving members’ credit scores. But that’s not all. To further promote Thank Use, the credit union employs a traditional press as well as social media full-court press that includes billboard, radio, television, digital advertising, social media engagement, and balloons and cookies in the branches.